My Grandfather Fisher played violin in the Heaton Electric orchestra for flicks and also for dancing; that’s where he met my Grandmother. Do we know why it was called Temple’s Folly; or if, in fact, it was ever a house? I never went there, or to the Lyric, but I went to the Scala once, to a Saturday mid-day show for kids and saw a very early Batman, along with a forgotten selection of suitable shorts. I never went again as it closed down soon after. The Imperial! My Gran said you went in with a cardie and came out with a jumper; worth it when it only coast a jam-jar though. 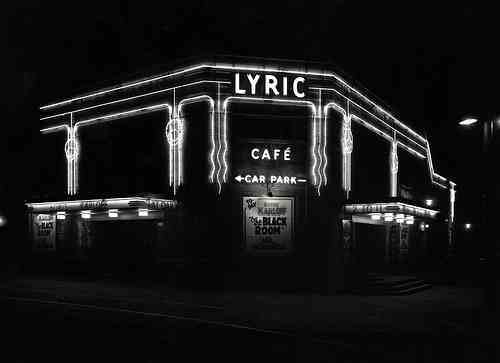 I was never away from Black’s Regal, and The Apollo – which had that wonderful ‘Crawling Border’ illuminated sign that always entranced me. I know, it’d be great to find out more about ‘ Temple’s Folly’. I wonder if Temple was a person and what made it a folly. Have done a bit of research on Temple’s Folly. The house which originally stood on the site of the Electric Palace was bought with a mortgage, as it was being built, by someone with the surname Temple and his business partner. The business relationship was dissolved and Temple was made bankrupt and seems to have defaulted on the mortgage. The building society took Temple to court but it was a complicated case and the judgement went against the building society. It was given leave to appeal. Haven’t found out what happened next but the house seems to have remained empty for around 30 years and eventually demolished to make way for the Electric Palace.You can understand the nickname! The story I heard was that Temple died before it was finished and the local council said that the building could not be used as a dwelling ( a house that people cant live in that sounds like a folly to me ). I have worked there now for 15 years and wondered why there were urinals in the top floor quarters. Looking at old pictures it seems to be a commercial center for Heaton with 4 self contained shop fronts and self contained cinema, dance hall upstairs and a billiards room in the basement and what looks like a smaller dance hall and offices up on the top floor. Great to hear from you. That’s interesting what you’ve heard about Temple’s Folly. Do you have / have you seen any pictures of the inside that we could look at and maybe feature on our site? Will you make it to our talk on the 19th? 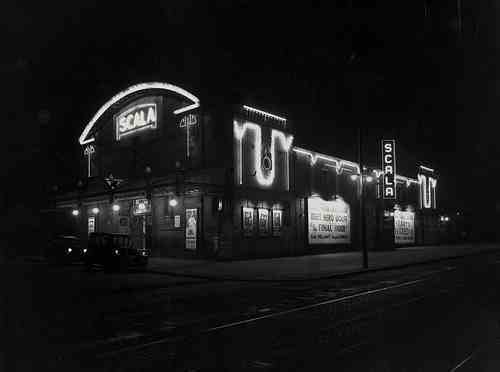 Sandra McClelland wrote to us: My friends and I went to the Scala every Fri. night in the early 50s and in my memory it was avery nice place. On Saturdays we all trooped to the Lyric cinema which tended to show a lot of M. G. M .musicals. I remember as a 10 yr old being blown away by the fantastic dance sequences of 7 Brides for 7 Brothers and the iconic Singing in the Rain. I lived on the corner of the coast rd roundabout, above Lilburns wet fish shop. Lived ther for over 20 years, and used to go to the Scala Saturday matinee, cost sixpencence, every sat morning. I think I must have seen every Flash Gordon ever shown, and others like it. The days of cliff hanger endings to make you come back. Great fun, great memories.Left around 1969, and sometimes go back, I like the memories. When the Scala closed, it was used to give dancing lessons for quite some time. I did go inside to see what it was like, and met the people who ran it. Lovely to hear from you, George. Thank you for taking the time to comment. If you need any information, especially regarding the roundabout, I would love to help. There wasn’t much passed our windows that we missed, and the factory workers , most from C & A Parsons, would pass in theyre hundreds on every kind of transport you could think of. When Parsons were delivering turbines, the telegraph poles and the stone pillar in the centre of the roundabout, had to be taken out and lain flat. When the pickford units had passed, usually took a few hours, they would be reinstated and reconnected. My entire childhood was spent roaming the streets with friends, or watching the world go past our window. In our teens, we were so good, we could identify almost any make of motorcycle from the sound of the engine. Most of the workers had motorcycles or push bikes. I have very fond memories of the area, had a cracking childhood. George. Do you happen to remember the ‘Civvie’ on Sackville Road? If you do, would appreciate a description and any memories associated with it. the civil defence unit on sackville road, I think, was red brick building, just up the road from the police station, and “the hussars” pub. I don’t recall anything but it’s presence. I didn’t really know it’s purpose as a youngster, and can not recall it ever being open. A friend said it was a small, underground unit, with steps leading down. I’m afraid thats all i know, but will ask around and see if I can find out more. George. Thank you – the point about it never being open was something that’s come up before. If you hear any more let us know – and I will tell you if we find out more. Do you still live locally? Was there a police station anywhere near the Hussars or the Civvie in Sackville Rd in the mid 60s do you know? I am asking because I have written a novel in which a ‘crime’ is committed in that area and i need to take into account if there was a police station there at the relevant time! I have not been able to confirm it but George above seems to suggest that it was there … Any info gratefully received! Hello Yes There was a police station right next door to the Hussars and between the Civvy as you mention. I lived just down the street from there. I was actually looking on here to see if I could find any information out about the Civvy. It was always a mystery building and I would love to know what was inside there ? I now live in North Wales, but still visit friends, and family occasionally. I do have one friend who lived in benton, and he has a very good memory. Together we both have an interest in the old Newcastle, when I say old, I mean the 50s and 60s. After looking on sites like yours, I find it almost a criminal act when i see what has been destroyed, and just plain furious when i see what has replaced it. What must have been in the minds of the council departments responsible, i can’t imagine. My main interest is in finding pics of the crossroads, when there was seating and grass lawn for us kids to play on. I think they remained when the big roundabout was put in, but completely disappeared when the underpass was created, along with several houses in all directions, I should add. That was when the masonic hall was demolished,on stephenson rd, plus many shops including Taylors bike shop, which stocked just about everything a young kid would be interested in. 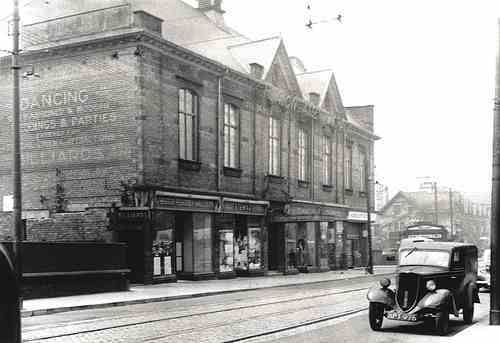 I have managed to find only one early pic which shows a tramcar pretty much in front of our old house. I would be grateful if you could let me know if any turn up. Please continue to ask for info, I may not be able to help, but I still have friends who can assist. George. Hi, just found this website in the process of researching George Besford who was the proprietor/manager of a picture hall in the 1911 census – I believe in Buxton road? Does anyone have any information that may explain how he went from being a shipyard riveter to silent film buff in the space of a few years?